This very well known dish is called “Kai Tod Hard Yai” ไก่ทอดหาดใหญ่ by Thai people. The chicken is crispy on the outside and soft on the inside, and you can taste the marinaded herbs deep inside next to the bone. Very succulent! This dish is often served topped with fried onions. 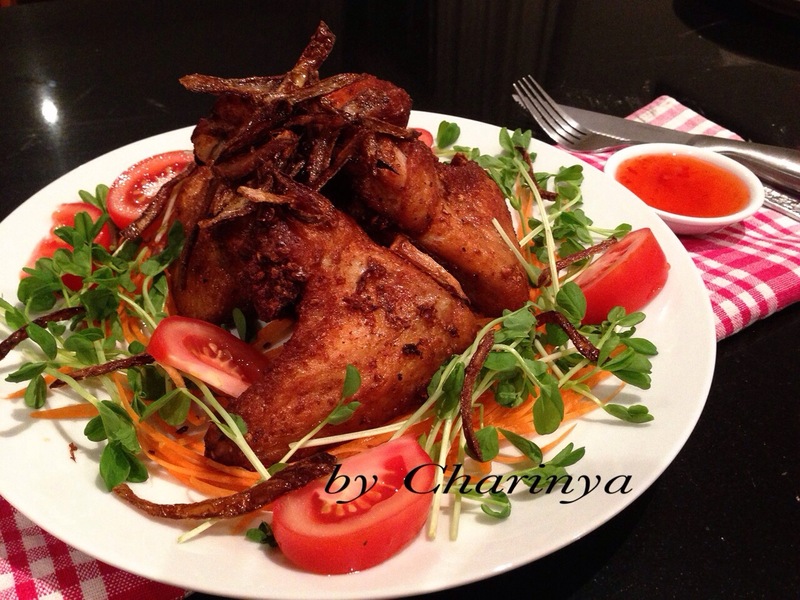 The recipe is shared by my friend “Penny”, who is a real Southern Thai girl. I thanks her for the beautiful and yummy recipe. • 6 chicken thighs, cutlets, wings or any chicken pieces you prefer. 1. Using mortar and pestle, grind the coriander seed, coriander root, garlic and pepper until very fine then transfer to the big mixing bowl. 2 . Add oyster sauce, soy sauce, sugar and seasoning powder in the bowl and mix well. Taste and add any/more sauce as desired. Add flour. 3. Add chicken and gently rub into the chicken so the marinade penetrates right through the chicken. Leave overnight in the fridge. The next day bring the chicken out, coat with some flour then deep fry to perfection. 4. Serve on a plate topped with fried onion, accompanied by rice or salad and sweet chilli sauce.